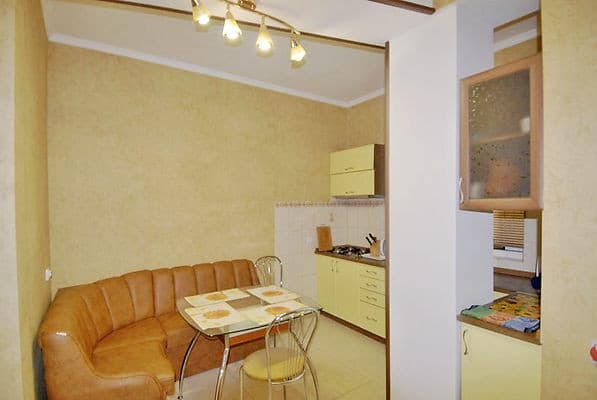 The apartments are located in the city center at the intersection of Tolstoy and Sverdlov streets, a 10-minute walk to Massandrovsky beach and the city waterfront. Transport infrastructure in walking distance. 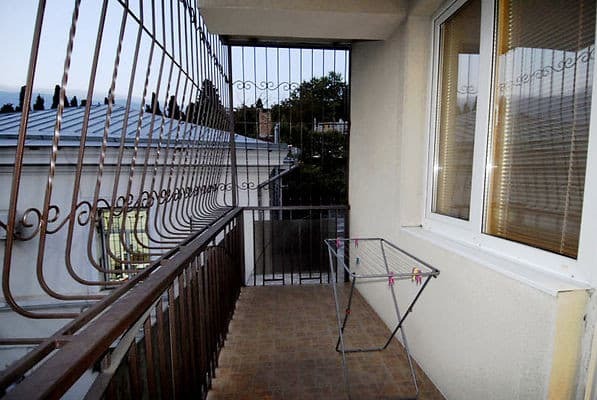 This one-room apartment has a large area with a wide open balcony. 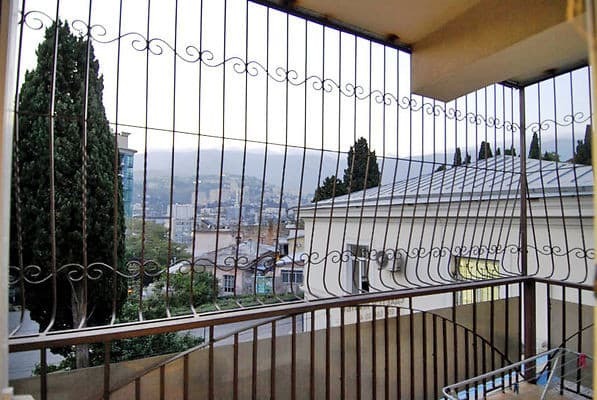 The apartments and the balcony offer panoramic mountain views. The apartment has new furniture and repairs, an artificial fireplace. In the room there are three beds. From the room there are two exits to the balcony. 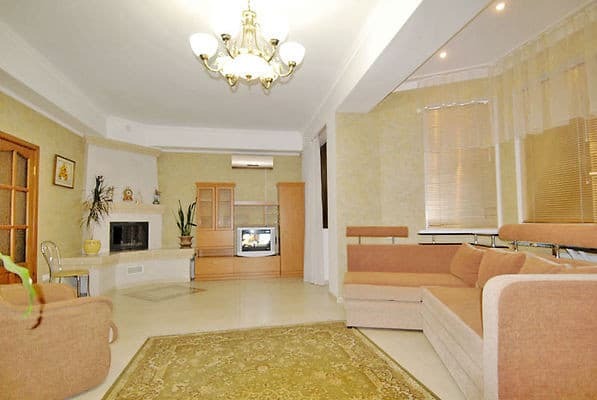 In the kitchen, the necessary utensils and appliances (stove, refrigerator, electric kettle, microwave oven). To services of visitors - a parking, high-speed Internet, a gazebo in a court yard of the house. Distance to the bus station of Yalta - 2,1 km; before Simferopol - 79 km. PRICES MAY CHANGE, IT IS REQUIRED TO RECEIVE INFORMATION FROM THE OPERATOR. Description of the room: In the room there are three beds: one large double bed, a large pull-out soft corner and a chair-bed. From the room there are two exits to the balcony. In the bathroom there is a washing machine, a bath, a mirror, a washbasin. In the kitchen there is all the utensils and appliances, in the yard there is a gazebo. The apartments are located in the city center, a 10-minute walk from Massandra Beach and the Waterfront. Nearby - McDonald's, the church of Polikurovskaya. Distance to the bus station of Yalta - 2,1 km; to Simferopol - 79 km. From the railway station of Simferopol on any transport to Yalta. Near the railway station of the city of Simferopol (exit to McDonald's, in the direction of the tower with a clock) are auto- and trolleybus stations. From there, by regular bus, fixed-route taxi or trolleybus number 52 you can get to Yalta in 1,5-2,5 hours. By car: from Simferopol, go along the M-18 highway to the Angarsk pass, then through Alushta - on the upper intercity route (landmark, so as not to get lost in Alushta - the wires of the intercity trolley bus), then go along the upper, intercity route (M-18) along the whole The Juba is still 41 km to Yalta.